"Social and emotional competence is the ability to understand, manage, and express the social and emotional aspects of one's life in ways that enable the successful management of life tasks such as learning, forming relationships, solving everyday problems, and adapting to the complex demands of growth and development. It includes self-awareness, control of impulsivity, working cooperatively, and caring about oneself and others. 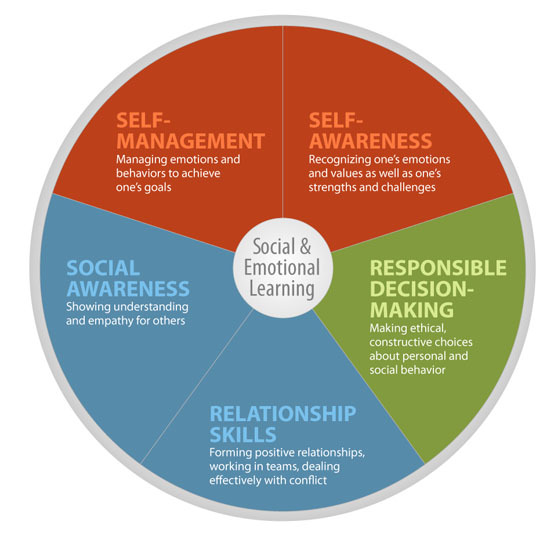 Social and emotional learning is the process through which children and adults develop the skills, attitudes, and values necessary to acquire social and emotional competence." The social and emotional education of children is addressed through efforts such as classroom instruction, extracurricular activities, involvement in community service and volunteering. Every day it becomes more clear that we can't fully address the "whole school, whole child, whole community" without taking account of social and emotional learning. Further, it's imperative we create a more unified approach to community leaders and corporations as well as teachers and children. We can't rely solely on giving kids the "right" information and hoping that they can pass on what they've learned to their parents or caregivers. A top-down approach, bottom-up approach or a one-size-fits-all approach all look good on paper but the change we seek is institutional and systemic. Social and emotional issues plague many schools, communities and families, sapping learning time, educator's energy and children's hope and opportunities. The promotion of social and emotional competence is the key to helping kids resist the lure of drugs, teen pregnancy, gang affiliation, truancy and dropping out of school altogether. "Movements" such as character education, violence prevention, values education, citizenship education and drug abuse education all have as objectives; to help children acquire the skills, attitudes, values and experiences that will help them to resist destructive behaviors, make responsible and thoughtful decisions and to seek out positive opportunities for growth and learning. "Can children become caring members of a school community without attention to the social and emotional dimensions of their lives? Again, the answer seems obvious. Caring is central to the shaping of relationships that are meaningful, supportive, rewarding, and productive. Caring happens when children sense that the adults in their lives think they are important and when they understand that they will be accepted and respected, regardless of any particular talents they have. Caring is a product of a community that deems all of its members to be important, believes everyone has something to contribute, and acknowledges that everyone counts." "If the goal of helping children become knowledgeable, responsible, and caring is a central element of social and emotional development and schooling, then institutions other than schools should be interested in fostering these qualities as well. Ironically, social and emotional skills, attitudes, and values have been embraced most enthusiastically in the boardrooms of corporate America. Moreover, businesses of all sizes have come to realize that productivity depends on a work force that is socially and emotionally competent. Workers who are capable of managing their social and emotional interactions with colleagues and customers, as well as their own emotional health, are more effective at improving the bottom line and at making workplaces more efficient. In light of new knowledge about social and emotional development, captains of industry and the moms and pops of neighborhood businesses are rushing to update their techniques for selecting and training workers, organizing the work environment, and developing managers and leaders. They understand that social and emotional competence may be more important than all of the institutions attended, degrees earned, test scores obtained, and even technical knowledge gained. More focus is being placed on problem solving, reflection, perceptive thinking, self-direction, and motivation for lifelong learning—characteristics that are useful no matter what the job (Adams and Hamm 1994)." "In today's world, and in what we can foresee as we enter the 21st century, nothing could be further from the truth. Reflect for a moment on how the world has changed in just the past five decades. Today, most children grow up in urban and suburban settings in a high-tech, multimedia world that provides constant stimulation, and sends largely unregulated messages about material goods and experiences that few youngsters experience directly or within their families. Many share a classroom with students of diverse cultures and perspectives and various abilities and disabilities. In this world, millions of good and decent children find that school is but one institution among many influences in their lives. It competes with peer groups, social service institutions, the media, the culture of competition, the pressure to conform, the need to be different, the tug of religious ties, the lure of risk, the fear of loneliness, and the complexities of family relationships in an age on the move. Youth who grow up in this world are all of our children. They come from every ethnic, economic, social, and geographic corner. Their teachers are accustomed to watching them struggle with the pressures and challenges of growing up. Learning at school is but a fragment of these challenges. For this learning to take place effectively, so that classroom lessons become life lessons, students need significant adults and peers in their lives to work with them as part of a community of learners. Only in such supportive contexts can they begin to piece together answers to the sometimes overwhelming social and emotional dilemmas they face."